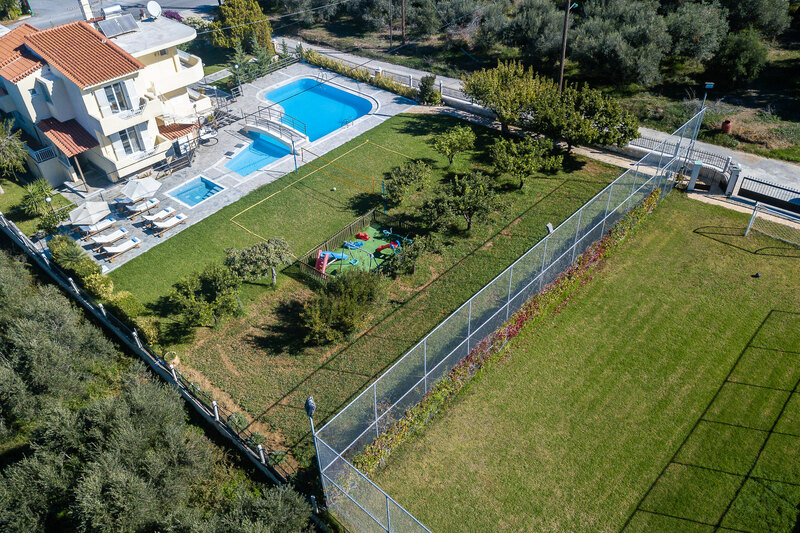 Villa Mary is a private holiday villa in a traditional Mediterranean village named Pigi, inside the enormous olive grove area with offering sea view, swimming pool, 5 bedrooms and unique outdoor facilities such as gym, mini soccer field, basketball court, table tennis and children's playground. 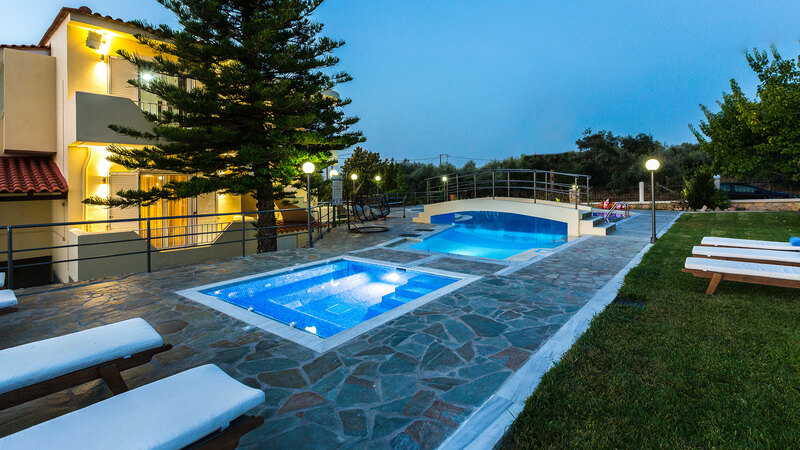 It is a perfect holiday destination for families with children or groups of friends! 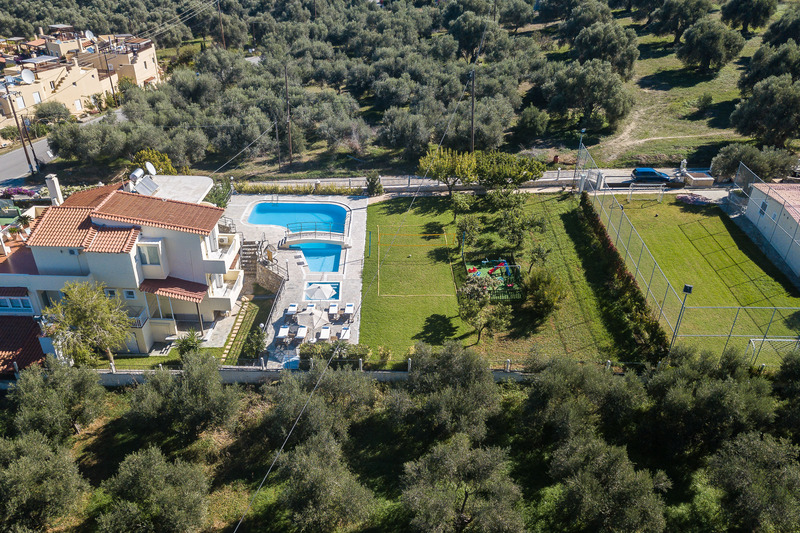 Villa Mary is a private holiday villa, located in the traditional Mediterranean village of Pigi, inside an enormous olive grove, offering beautiful sea and mountain views! 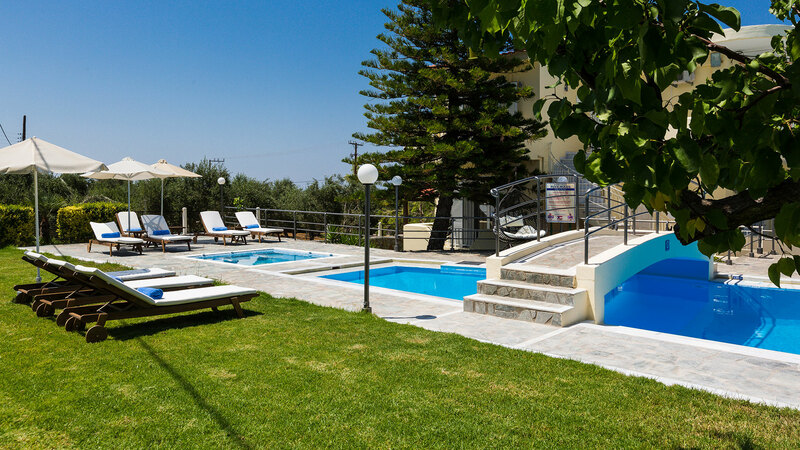 The villa is divided into 3 independent floors and covers 300 sq. 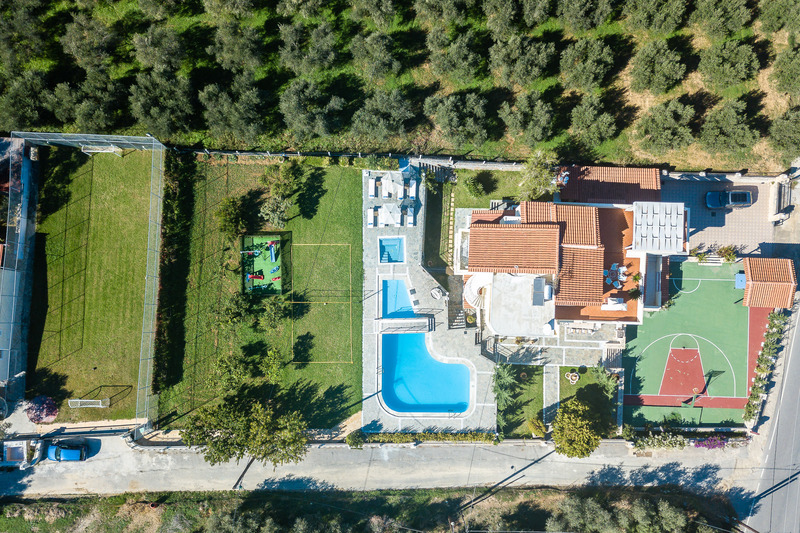 m. in total, situated in a plot of 3.000 sq. 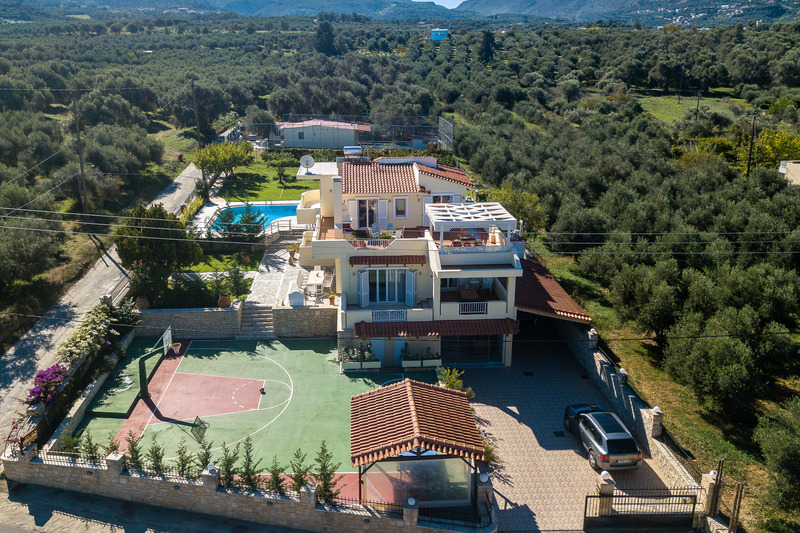 m. and it can accommodate 10 guests in its 5 bedrooms and up to 12 if necessary. 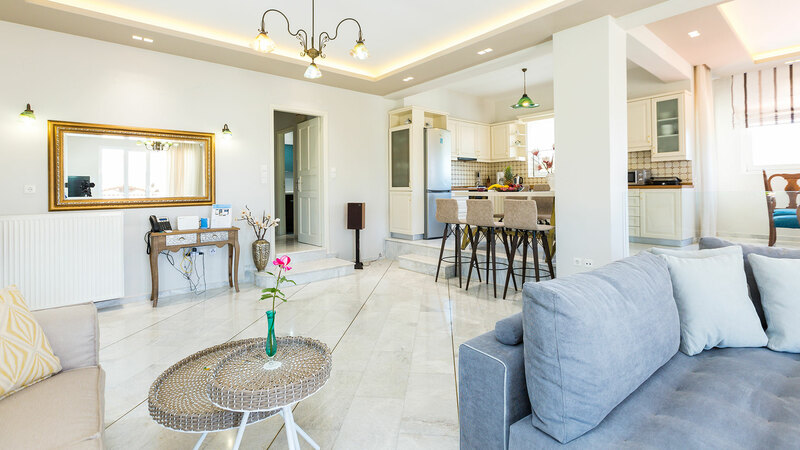 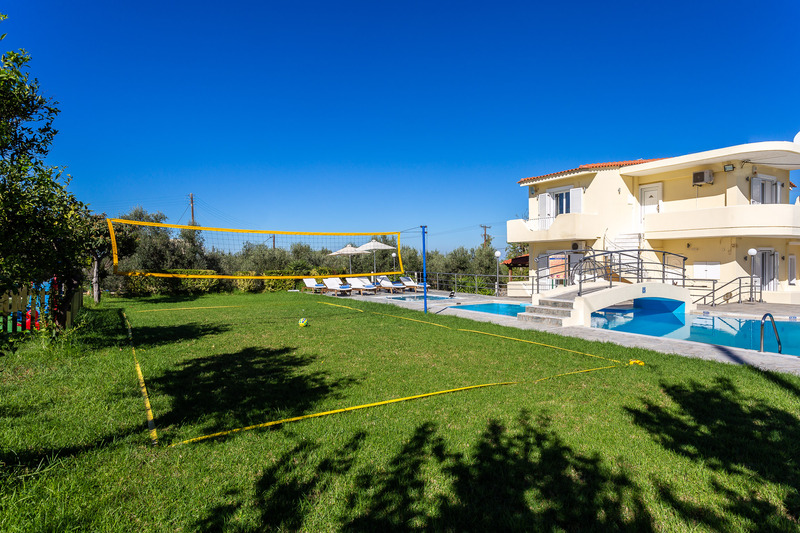 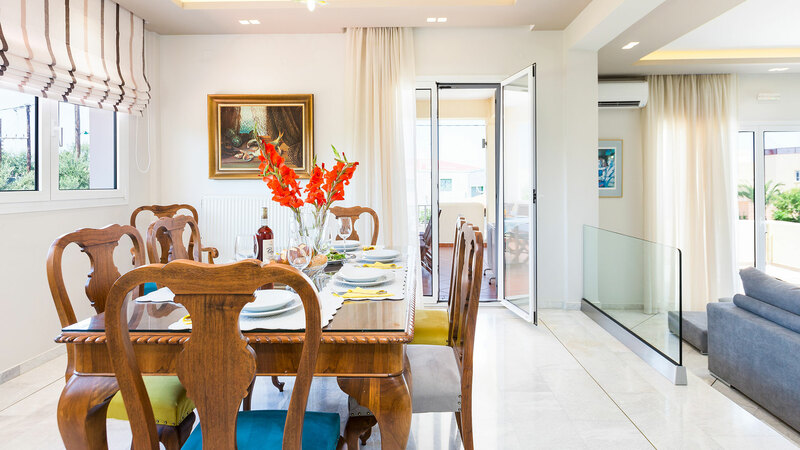 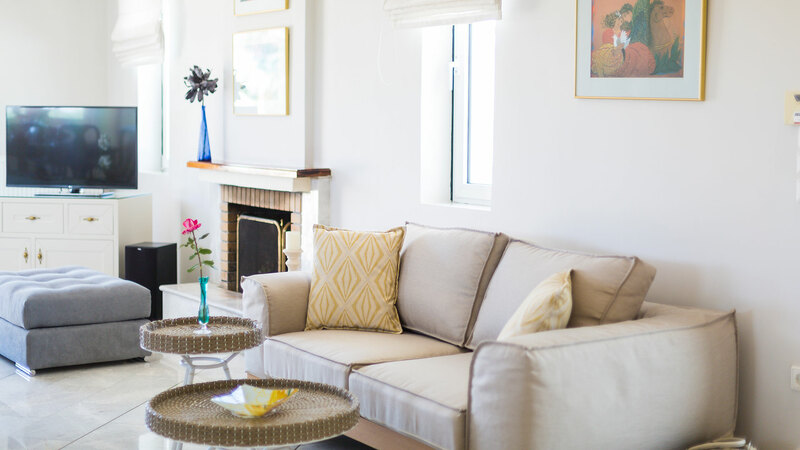 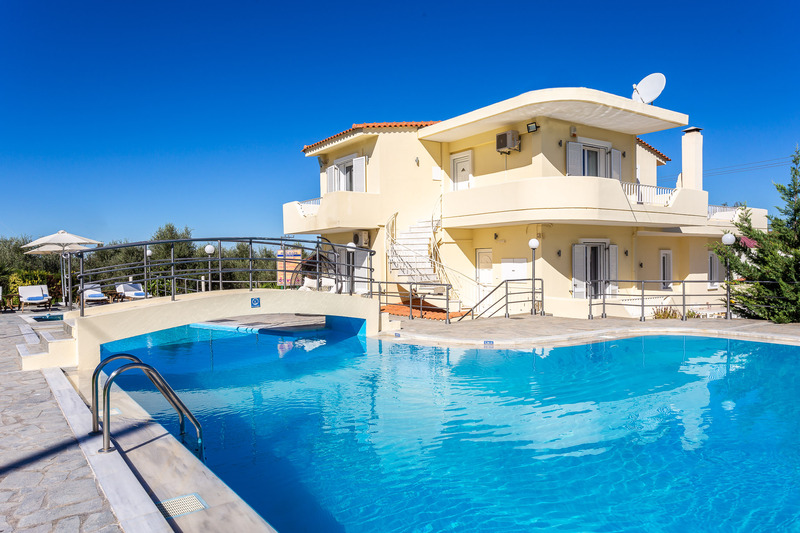 The Villa is a perfect holiday destination for families with children or groups of friends, as it boasts an impressive array of outdoor facilities as well and it’s within walking distance to the nearest shops (800 m) and just a short drive away from the beach and Rethymno town. 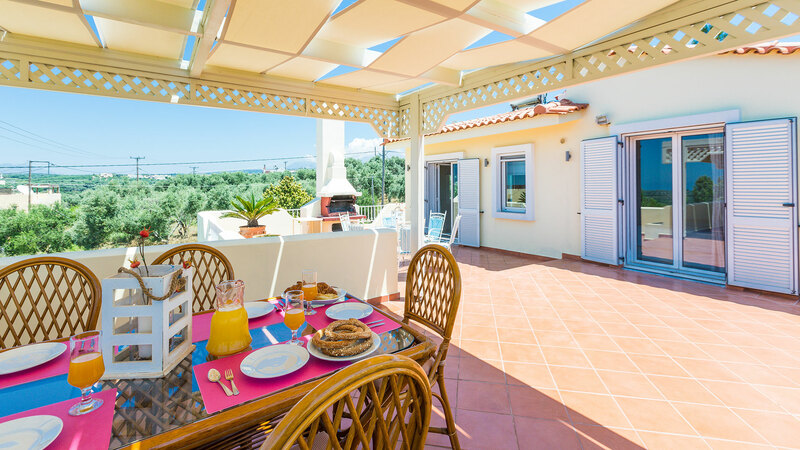 To make things even better, the owners also own a traditional tavern, just 40 m away from the villa, where you can have breakfast or lunch with special prices upon request. 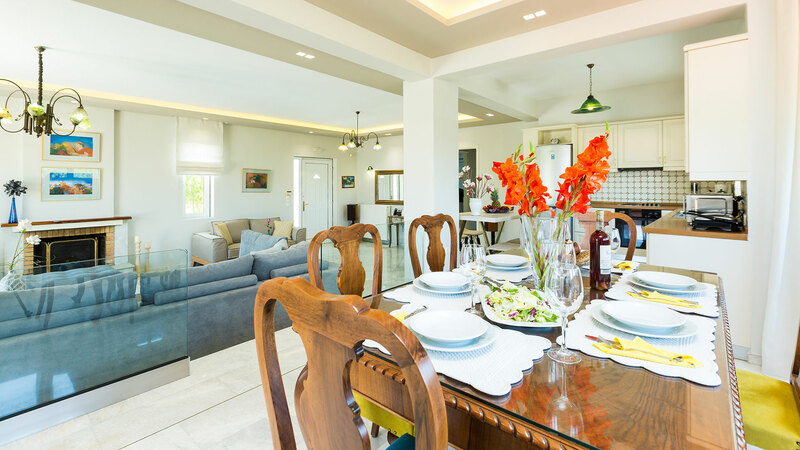 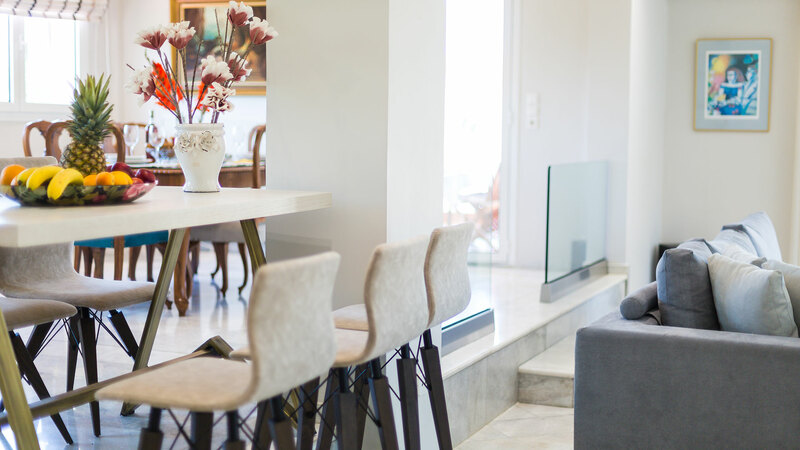 Entering the villa on the ground floor, there is an open plan area combining a dining area, a split-level living room featuring a 42" HDTV and a fireplace, as well as a fully equipped, open plan kitchen. 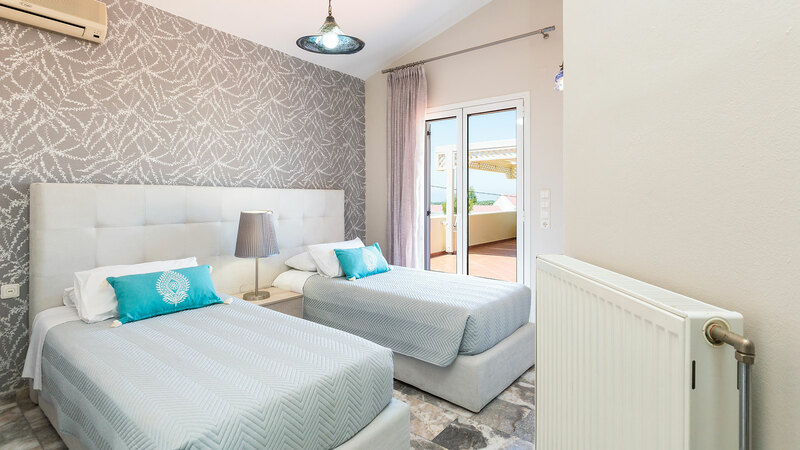 On the ground floor you will also find two bedrooms, one with a double bed and en-suite bathroom with hydromassage bathtub and the other one with 2 single beds which has an en-suite WC. 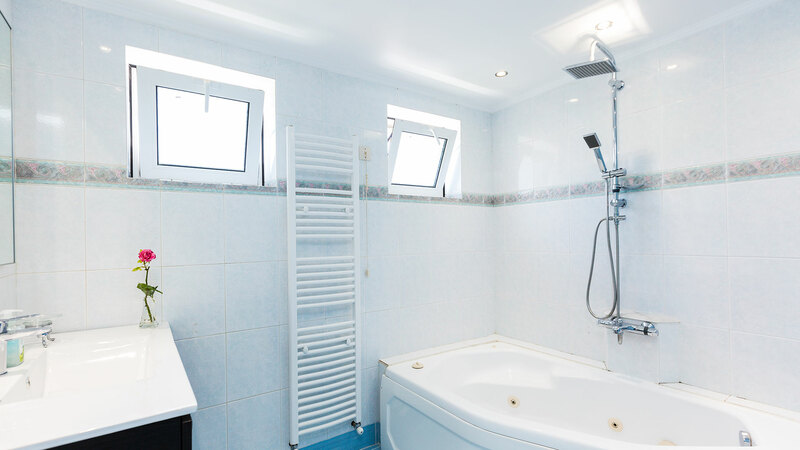 Also a bathroom with shower and washing machine can be found on the same level. 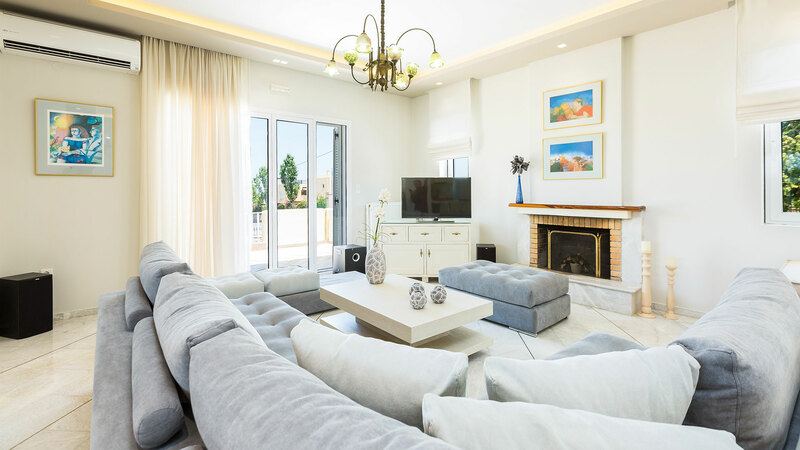 From a separate entrance you can reach the first floor of the Villa, entering into a playroom area with 46” HDTV and a Playstation 4 console. 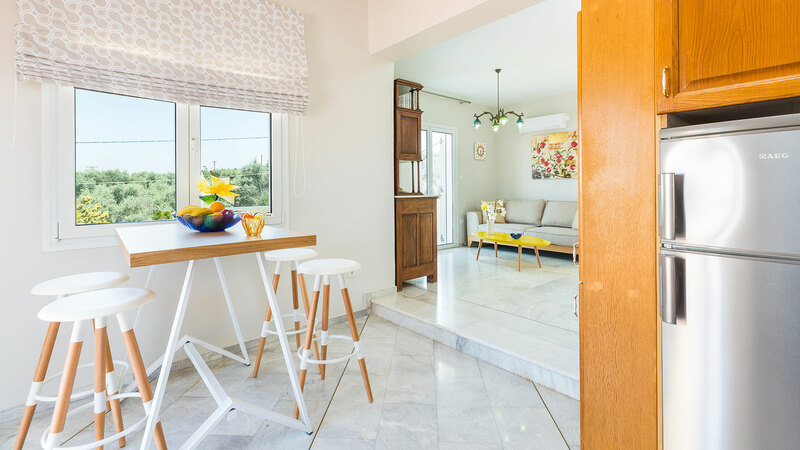 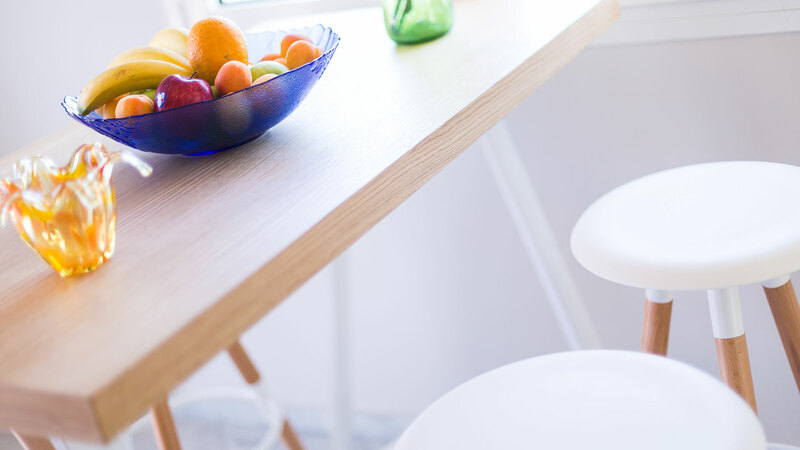 A second open plan kitchen with small dining area is available and it offers access into a spacious 100 sq. 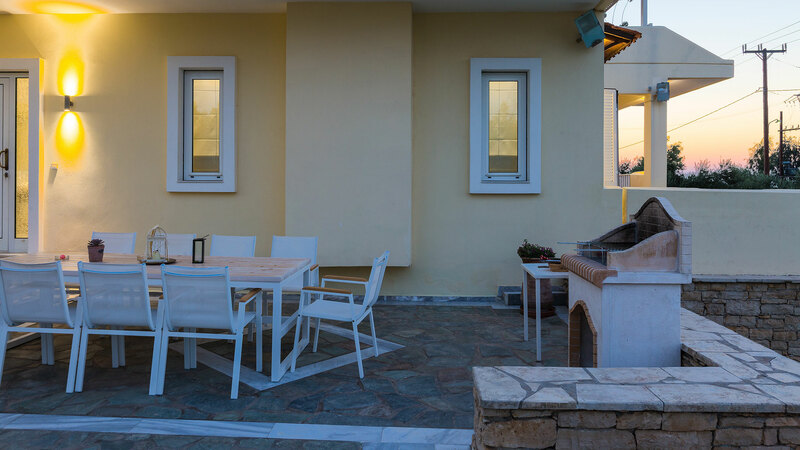 m. veranda, equipped with seating and dining area and a barbecue, while offering wonderful sea and mountain views. 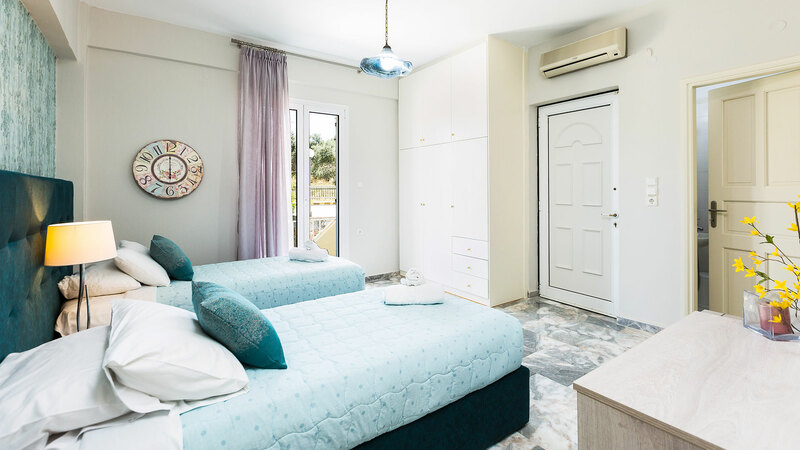 On this floor you will find 2 additional bedrooms, one with 2 single beds (which can be transformed to be a double upon request) and the other one with a double bed with en-suite bathroom with shower. 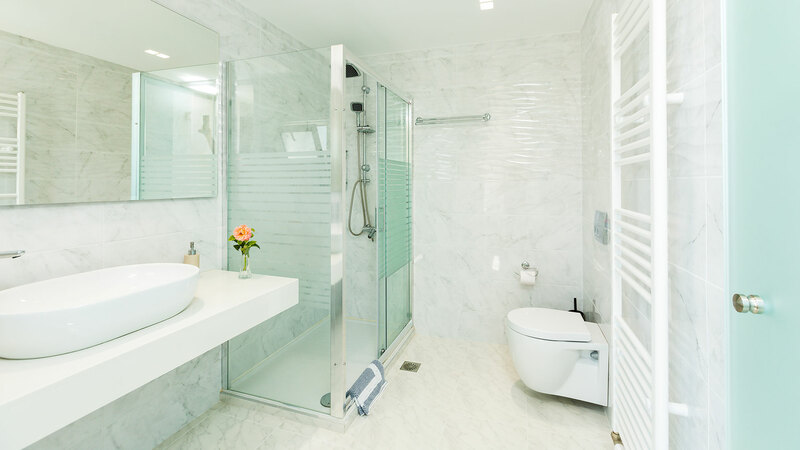 There is one more bathroom with shower is found on this floor. 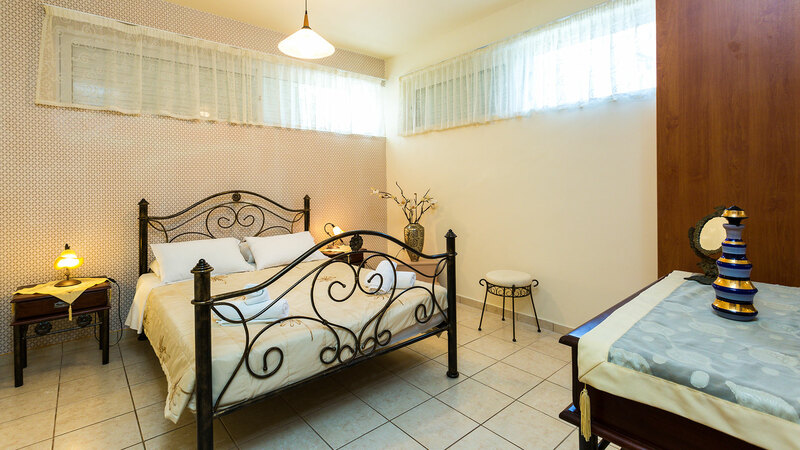 Also having a private entrance, guests can find the fifth bedroom on the lower floor, featuring a double bed. 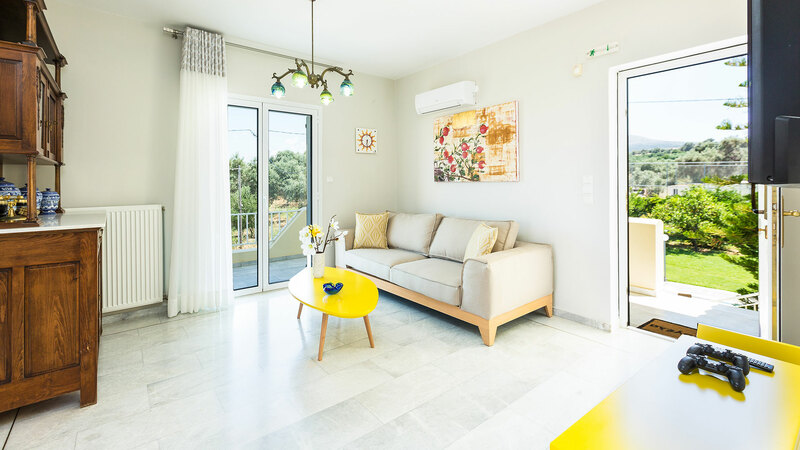 Please note that the lower floor is not air conditioned, however the room is very cool and fans are also provided. 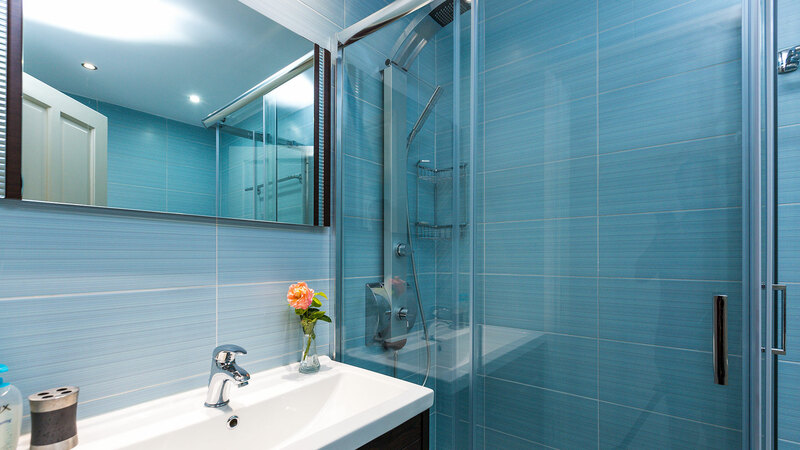 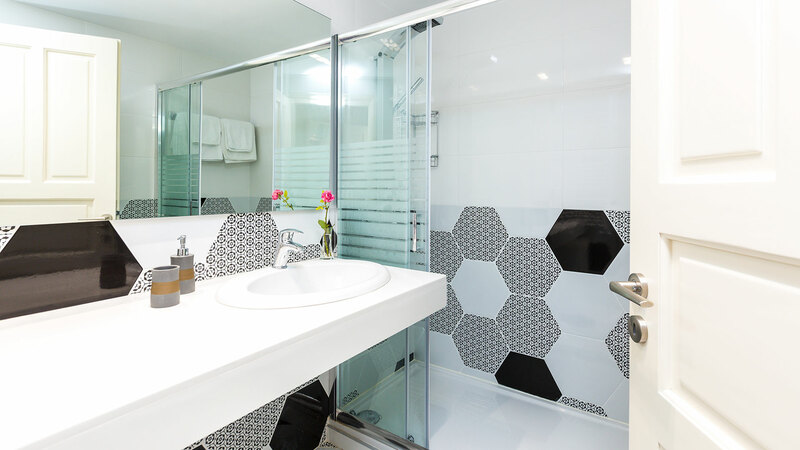 A bathroom with shower is also found on this floor, as well as a well-equipped gym. 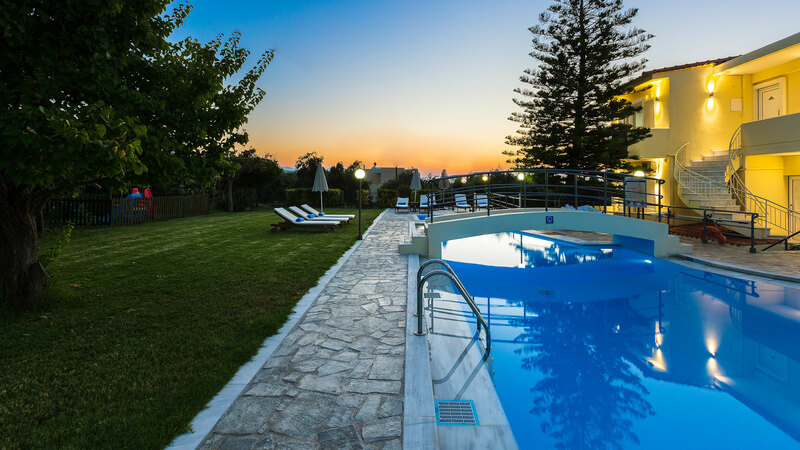 - It is a great choice for groups of people who wish to stay in the beautiful countryside of Crete and be also close to the beach. 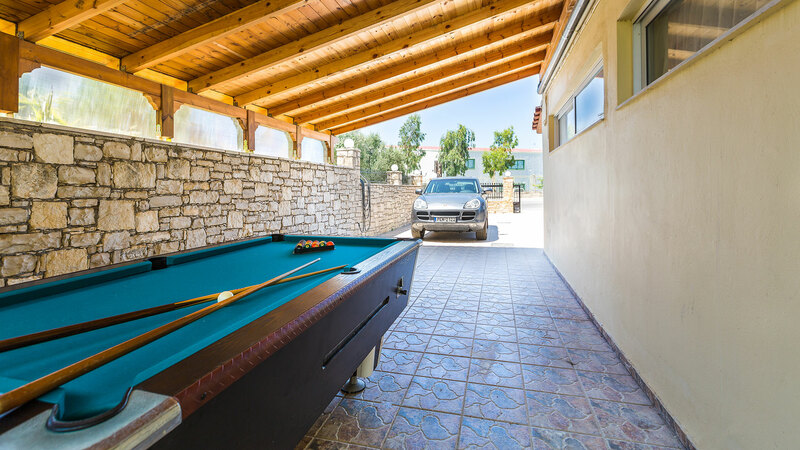 - The location is ideal as the house is close to urban areas but it offers peace and privacy to its guests. 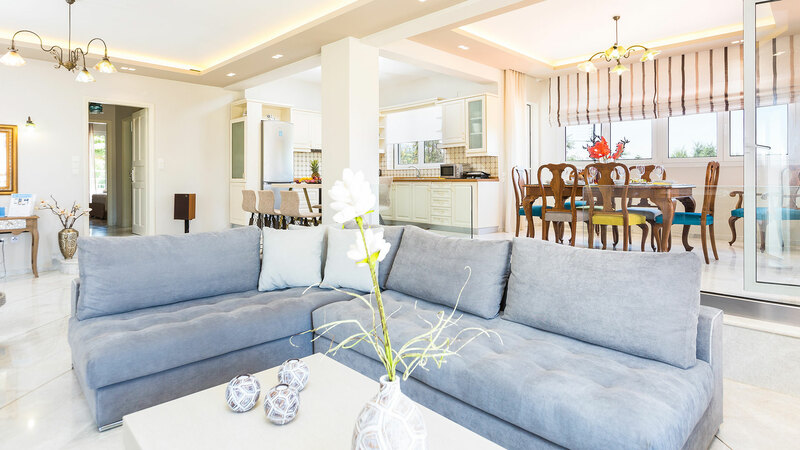 - The fact that the ground floor is absolutely separated from the first floor which provides complete privacy among your groups. 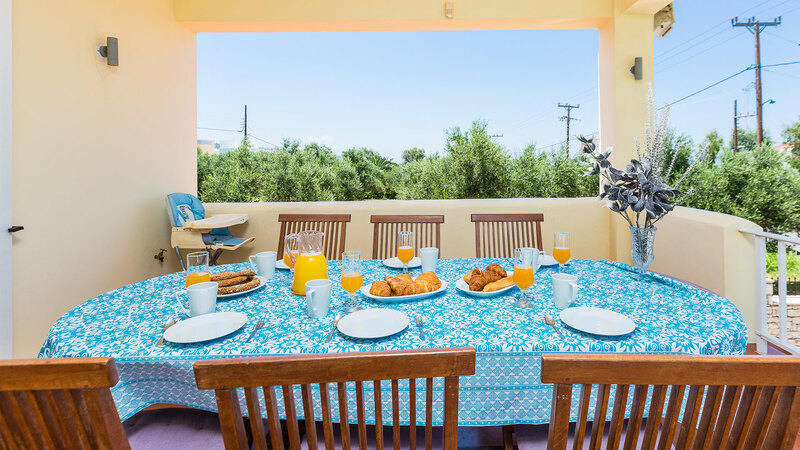 - You can enjoy the delicious Cretan cuisine in the owner's taverna which is located 40 m away from the villa and offers special prices to the guests of the villa. 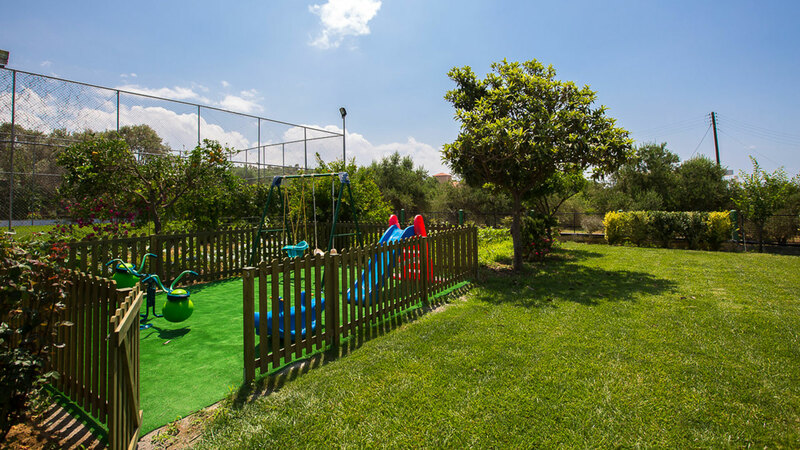 - Various facilities for children include indoor playroom area, outdoor playground and separate shallow part of the pool. 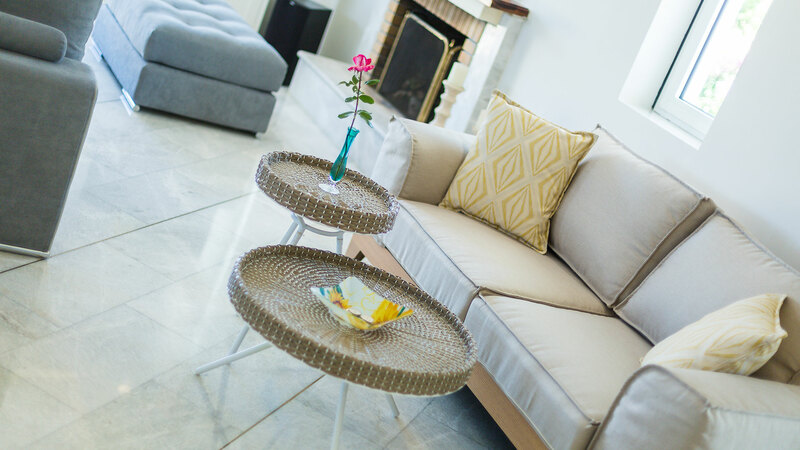 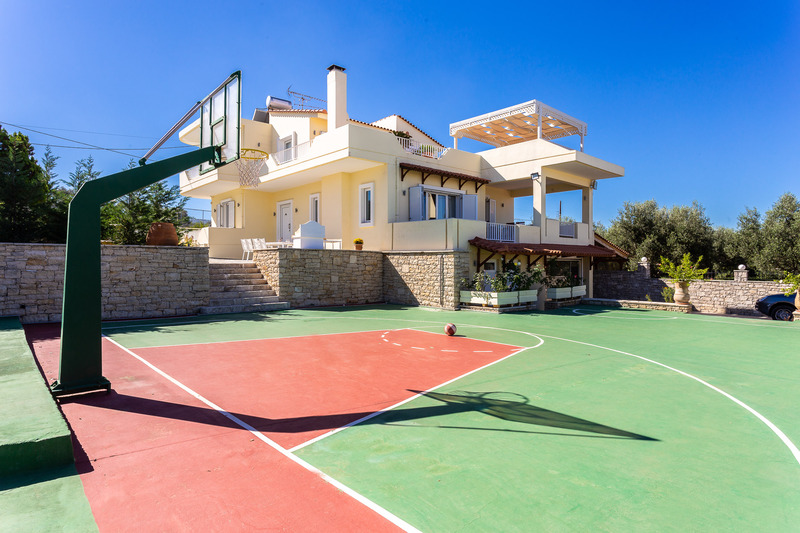 - The villa offers beautiful and spacious outdoor areas where the guests can enjoy relaxing or activities with unique facilities such as gym, table tennis, basketball court or football field! 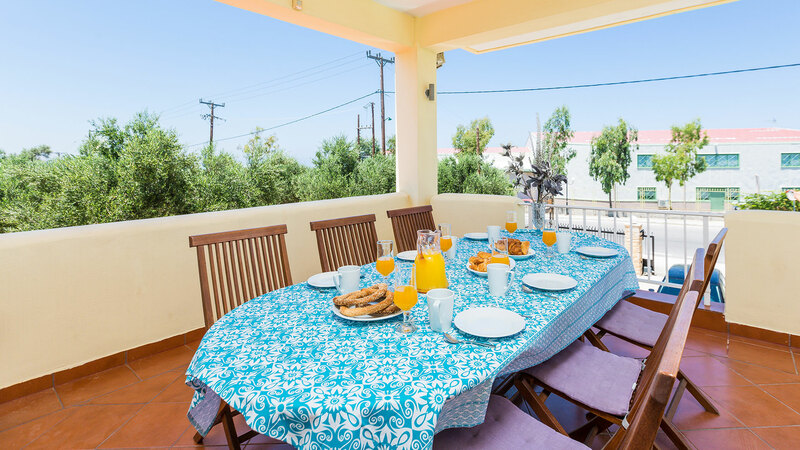 - Spacious fully equipped and organised barbecue area with wood oven. 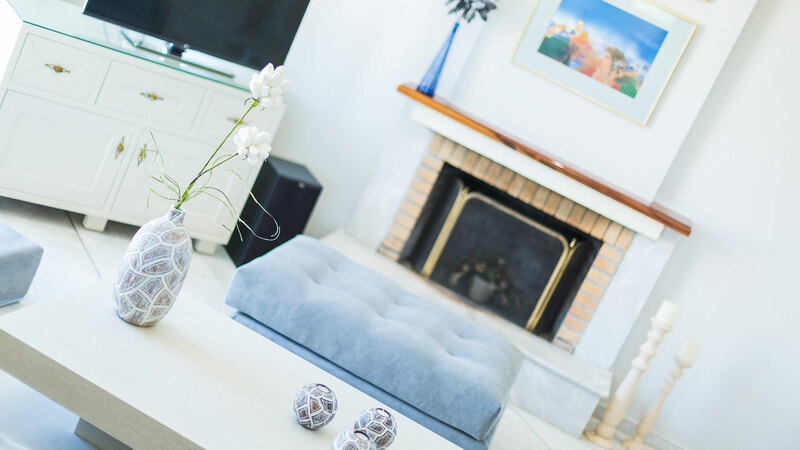 There is a spacious open plan living room area with satellite 42" HDTV and a fireplace on the ground floor. 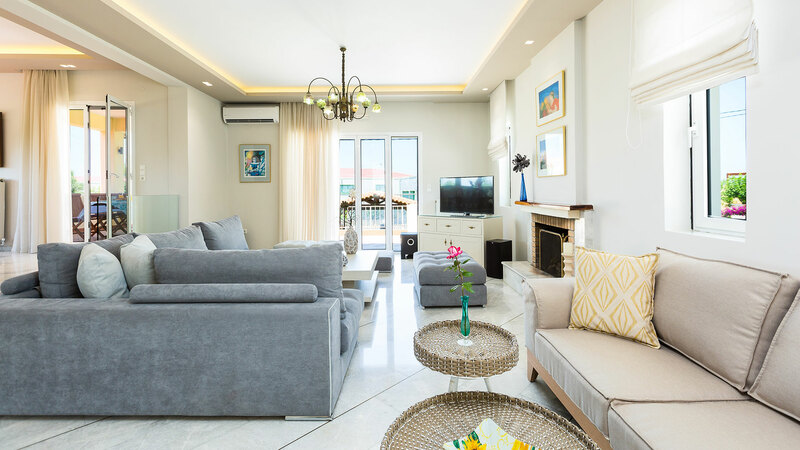 The living room area has direct access to the 100 sq.m main veranda which has a beautiful sitting area with sea view! 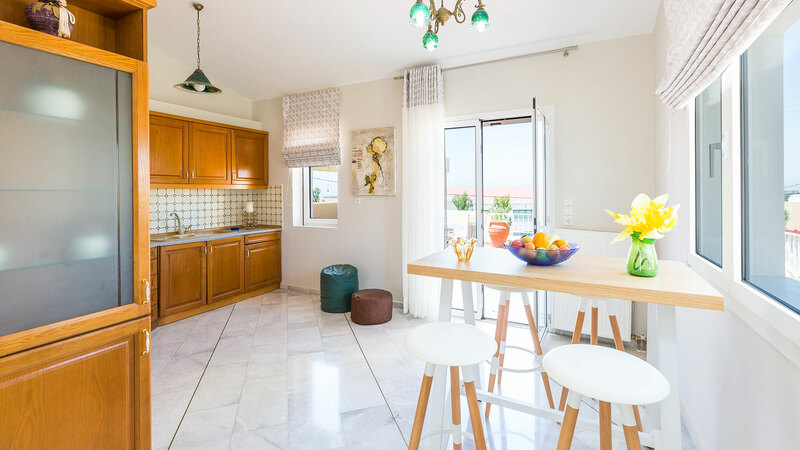 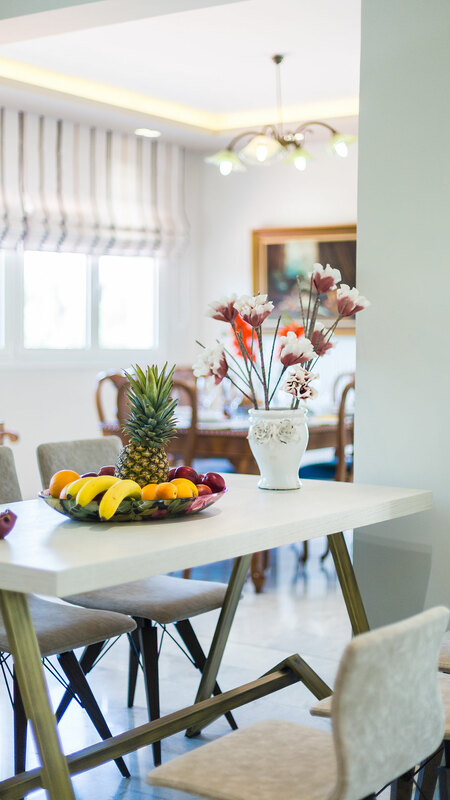 The villa has two kitchens, one main fully equipped kitchen on the ground floor and the another smaller one on the first floor. 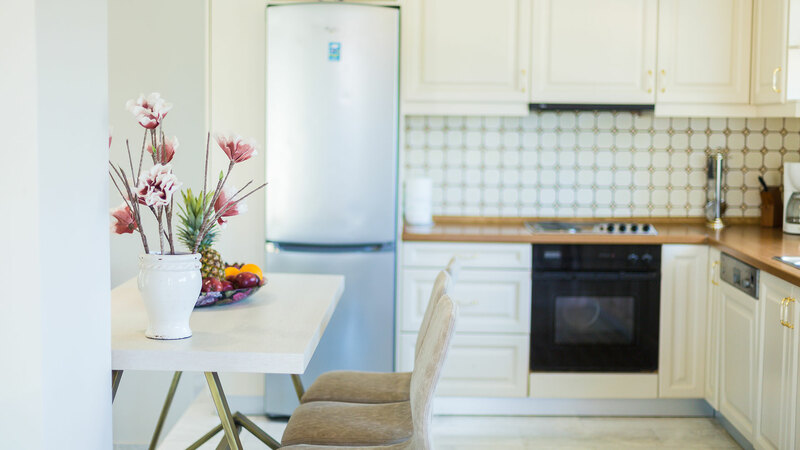 The main kitchen contains a refrigerator, an oven, 4 ring stoves, a microwave, a dishwasher, a toaster, a blender, one filter coffee machine and dishes and utensils for more than 14 people and an indoor dining table. 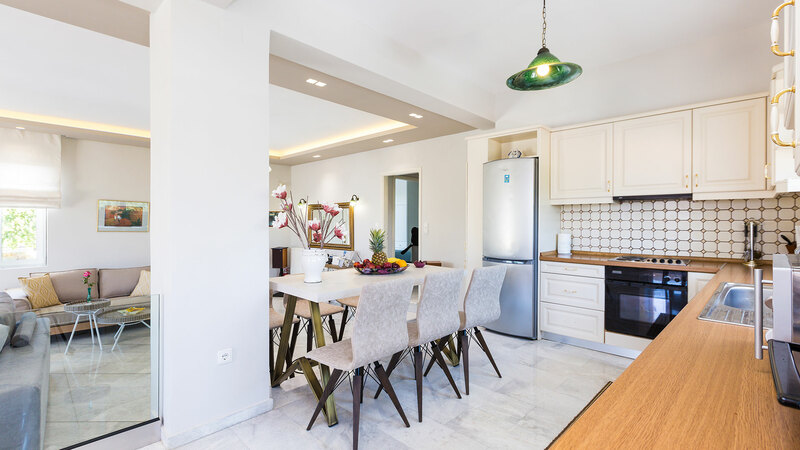 The secondary kitchen is located on the first floor with a dining table next to it. 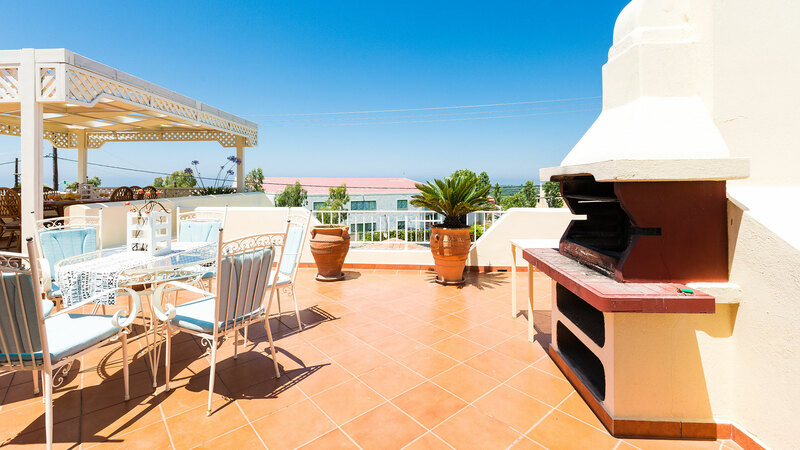 You will find 3 barbecues in the villa. 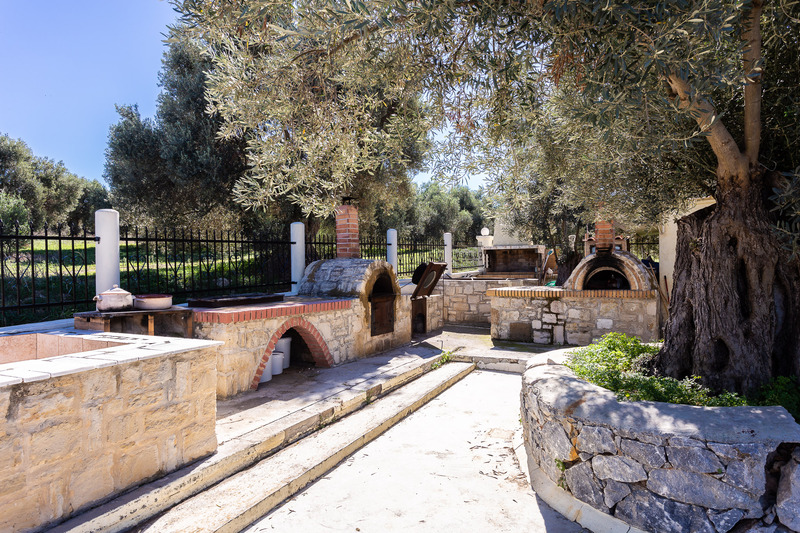 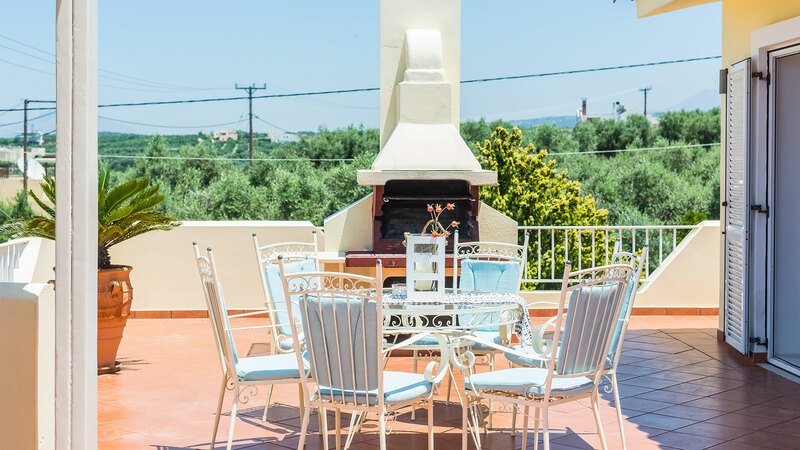 A fully equipped barbecue area is located next to the pool which also contains a wood oven, and another one next to the dining table near the main entrance to the villa. 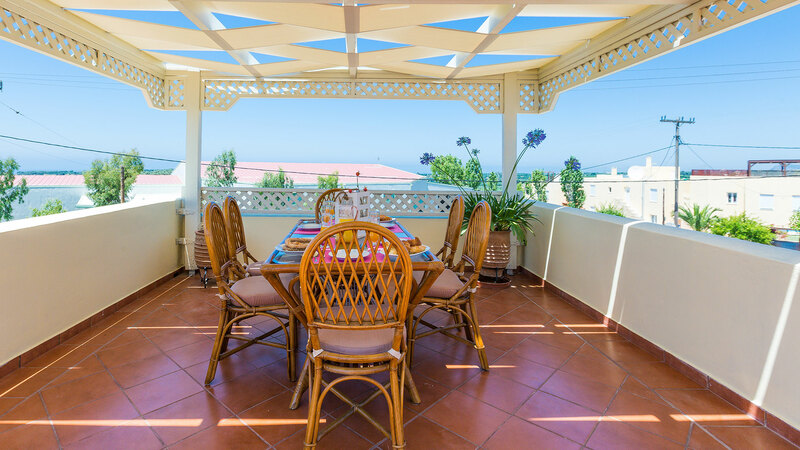 Additionally there is another one in the main veranda on the first floor. 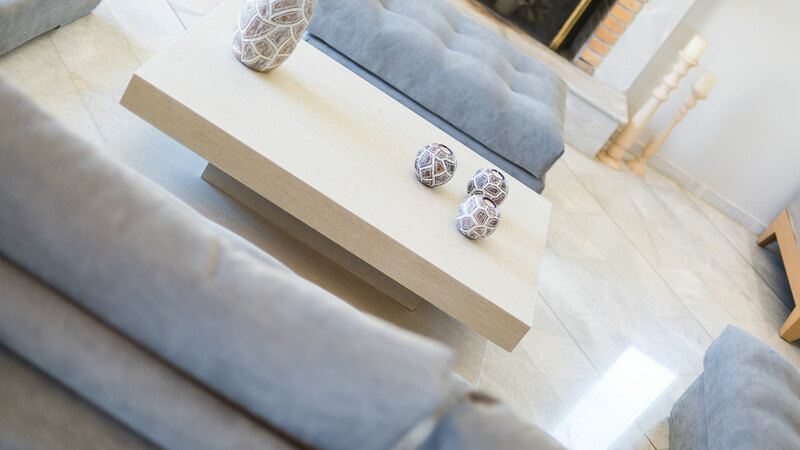 We will provide you everything that you might need like charcoal. 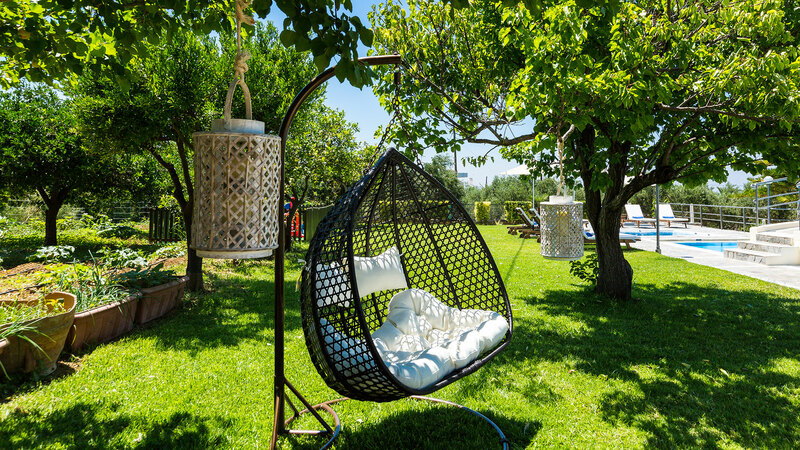 Our garden is surrounded by numerous fruit, palm and olive trees. 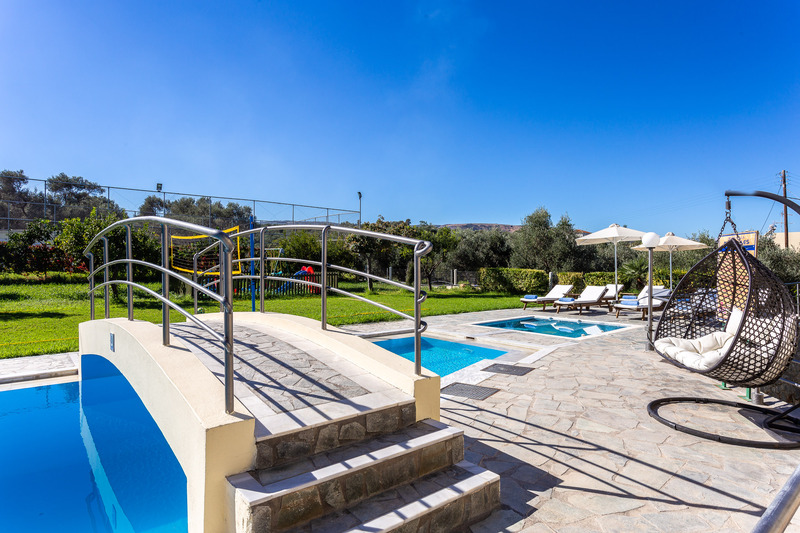 In addition to the spacious pool and the barbecue, you will also find a safe playground for children and sitting areas. 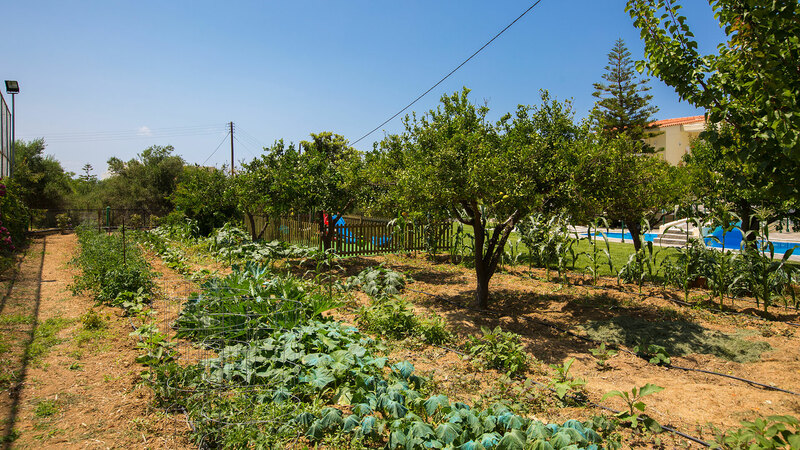 Our vegetable garden hosts a variety of vegetables and all garden produce is entirely at your disposal. 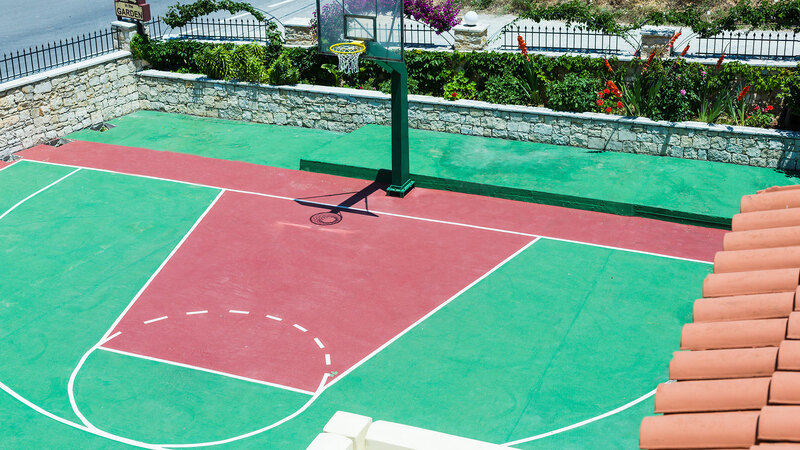 Our unique outdoor facilities are the highlight of the villa! 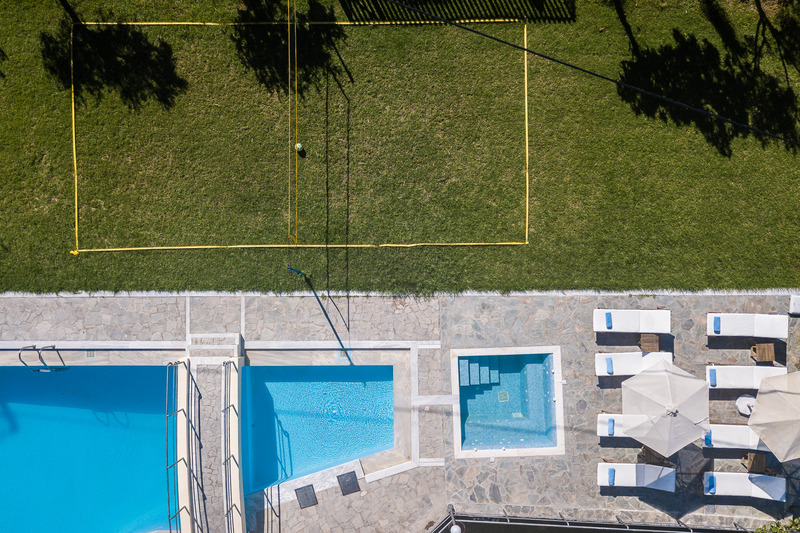 You will find a half basketball court, mini soccer field, pin pong table under the pergola and a pool table in outdoor area which will entertain all guests. 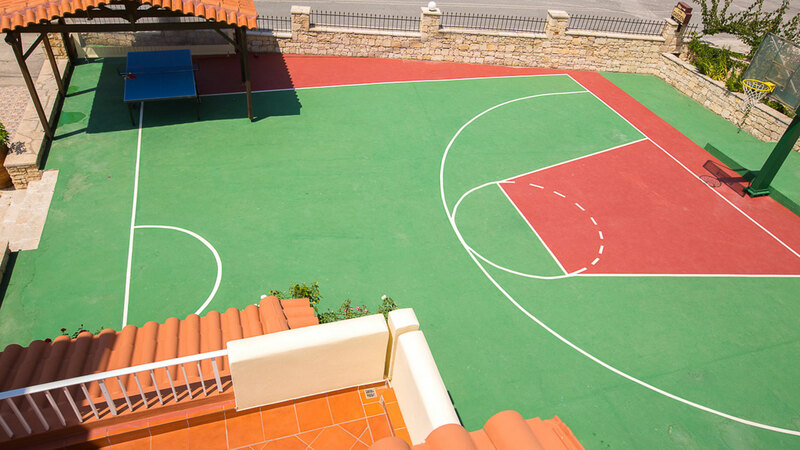 Our unique outdoor facilities are the highlight of the villa! 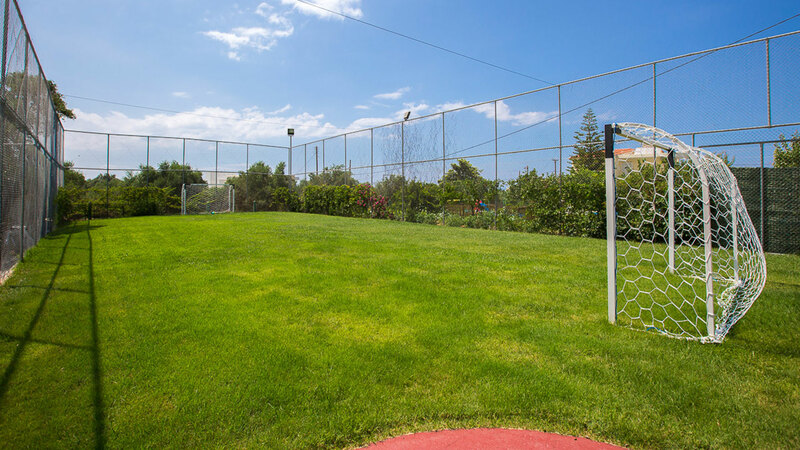 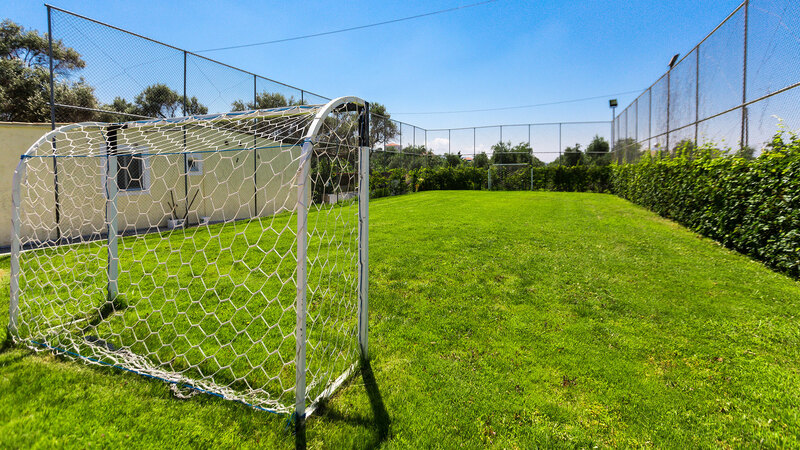 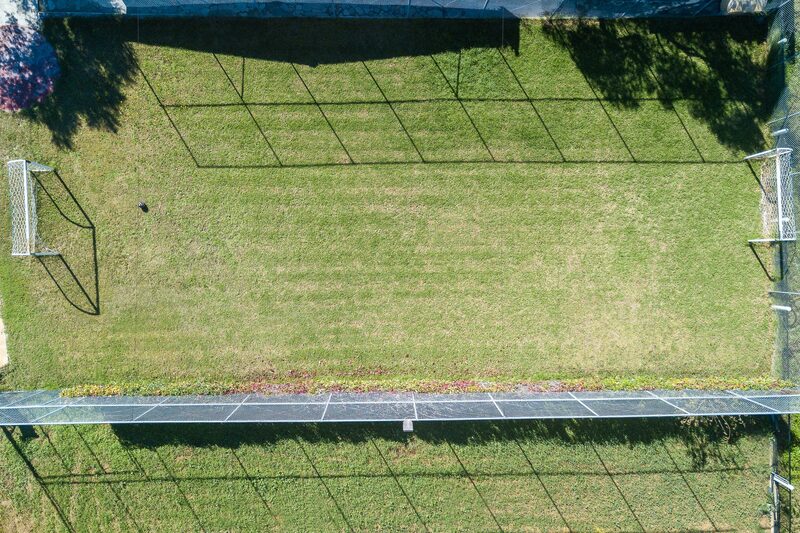 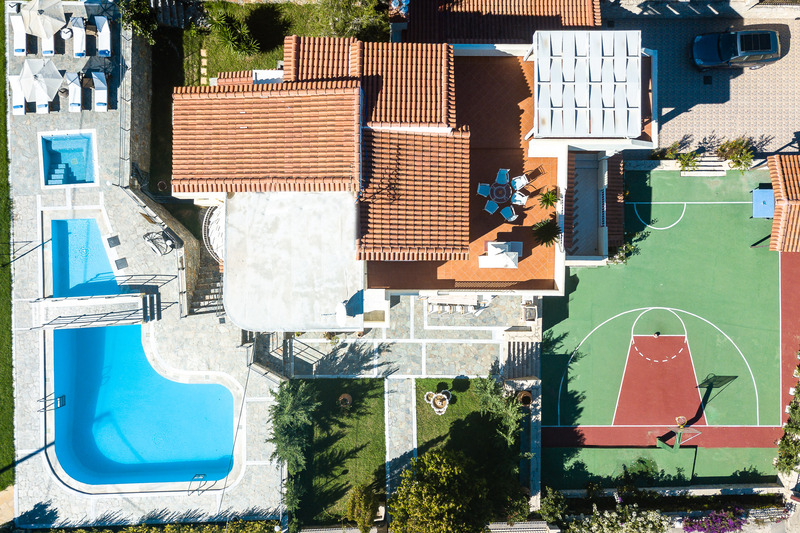 You will find a half basketball court, a volleyball net, mini soccer field, pin pong table under the pergola and a pool table in outdoor area which will entertain all guests. 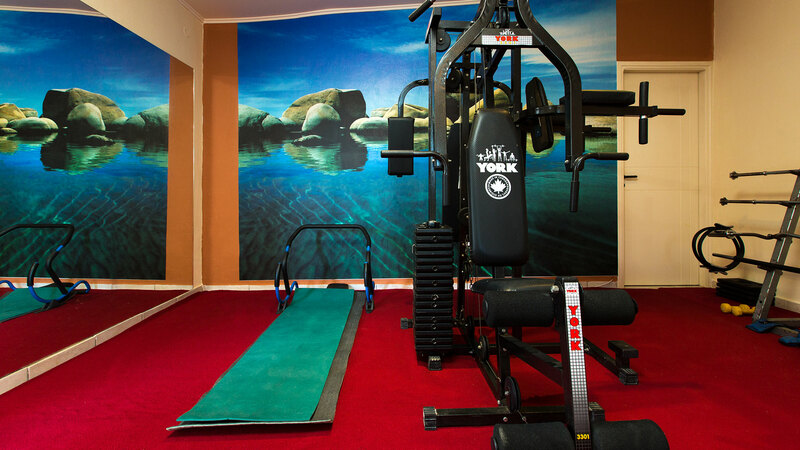 Also, there is a gym room next to the mini soccer field in outdoor area. 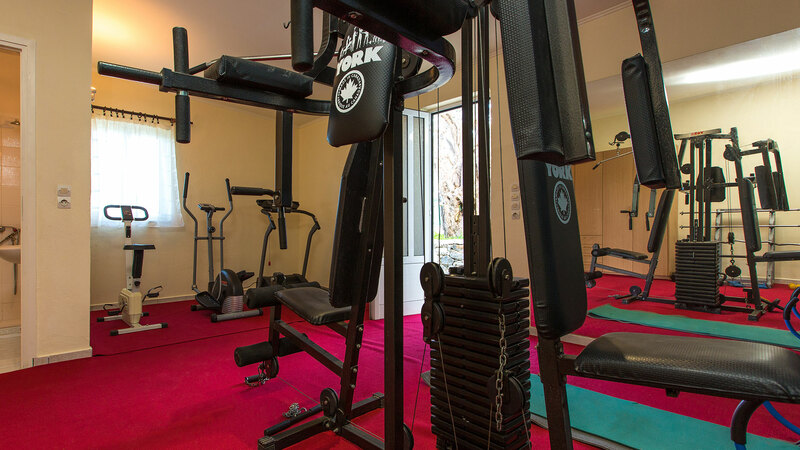 It has a collection of fitness equipment such as a treadmill, abs equipment and a fitness multifunctional apparatus.